The number of town festivals held in Iceland in the summer has been increasing in recent years. They have become a valued part in the cultural life of many towns and communities in the country. 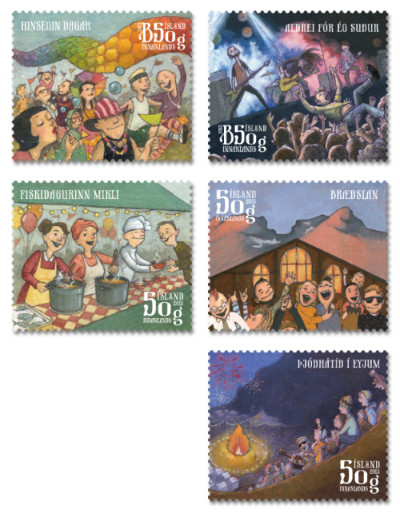 The stamp motifs are 5 town festivals held across the country. These are; The Reykjavik Gay Parade, Never Been South music festival in Isafjordur, The Great Fish Day in Dalvik, The Smelter music festival in Borgarfjordur eystri and The Vestmannaeyjar National Holiday.